By plane: Liverpool John Lennon Airport has a regular bus (click here for further details) with Liverpool City Centre, or a taxi ride is approximately seven miles. 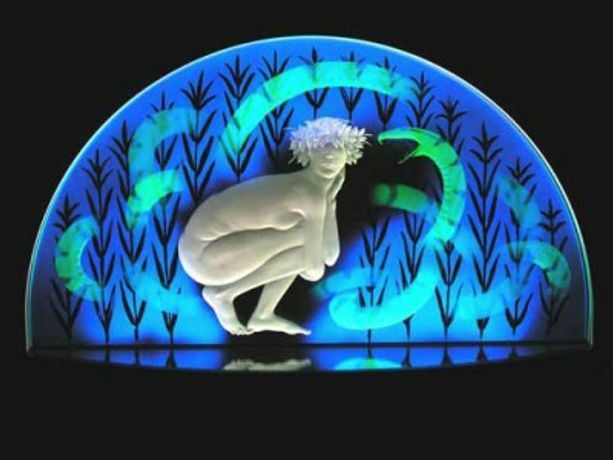 We are delighted to show the work of the internationally renowned glass engraver Alison Kinnaird MBE here for the first time. "Glass is a seductively beautiful medium. It has a more versatile nature than any other material. It can be made to resemble stone, water or metal, ceramic, gems or textiles. It can be solid or liquid, transparent or obscure, smooth or textured, heavy or apparently weightless. But it is in partnership with light that glass comes alive. It is then glowing and brilliant, reflective and refractive. These qualities suggest the images to me, created by copper wheel engraving, a technique which has remained basically unchanged for two thousand years. Wheel engraved images have a gem like precision and delicacy, and a subtlety of modelling which is impossible with any other technique. It is superlative for detailing the play of muscle and the velvet sheen of skin. The human figure is the main subject of my work. Male or female, they are clothed or unclothed, and thus are not tied to any particular era for fashion. Glass has a timeless quality, technically still liquid, yet frozen motionless for the moment. My inspiration is firmly rooted in Scotland, though the references may not be literal or specific. The starkness of the landscape, the relationship of air and water, and recurring images of standing stones and boats, all carry symbolism on a number of levels, both personal and universal. Alison is also one of the foremost exponents of Scottish harp music, playing both gut and wire-strung Scottish harps. A recipient of many awards and winner of many competitions, her contribution was recognized in 1997, when she was presented with an M.B.E. for services to art and music.